We asked Craig Randall, a $40 million producer how important it is to be introduced at your seminar properly. Craig considers it of the utmost importance. “Have your assistant introduce you as it creates an opportunity to have everyone turn around, get seated, quiet down, and remind everyone to turn off their cell phones. Your assistant should give a brief introduction about your education, designations, time in the industry etc. which builds credibility. Then they say “”now let’s welcome Mr. Craig Randall with a warm round of applause." "Now you are the esteemed professional walking into a room of applauding people with everyone ready and receptive to hearing what you say. This is so much better than the standard form of introducing yourself. It changes the psychology of the room. Everyone is more receptive and positive. This allows you to start from a more powerful position of respect. Then, when you give an instruction, like fill in their forms the way you want them to, they are more likely to do it." We also asked Craig about Seminar Crowds, Inc. invitations. 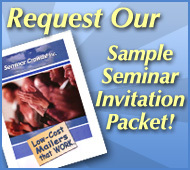 With Seminar Crowds, Inc. you get postage, RSVP’s and top rated mailing lists for one low price. For more information on Seminar Crowds, Inc. “Low Cost Mailers that Work” call Tanner Gire, National Sales Manager at 800-207-3840 or email him at tanner@seminarcrowds.com. For information on Craig Randall training programs please contact Alan Susie Zolo at 800-567-6010 or email her at susie@randallmarketinggroup.com. We asked Craig Randall, a $40 Million producer to give Seminar Crowds clients the most important thing he does that makes him so successful. "Go for one piece of business at a time I look for the most simple, easiest, and most obvious piece of business to replace that can truly help the client. I want to commence our relationship without the client feeling that they are making too big of a decision or that they are making me their new financial advisor for life. The bottom line is I want to make them feel very comfortable with me first and then continue to develop the relationship. That is why virtually everyone I see becomes a client of mine." We also asked Craig about Seminar Crowds invitations. 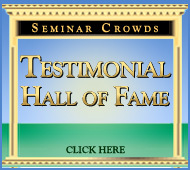 "I have used Seminar Crowds invitations for over two years. I have switched from costly wedding style invitations to Seminar Crowds mailers and always get great results! What’s most remarkable is that I saved well over $100,000 versus what I would have spent on the high priced invitations I used to use." 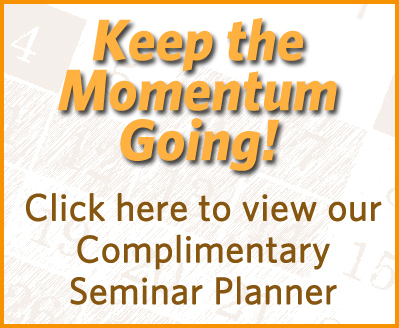 With Seminar Crowds you get postage, RSVP’s and top rated mailing lists for one low price. For more information on Seminar Crowds “Low Cost Mailers that Work” call Tanner Gire, National Sales Manager at 800-207-3840 or email him at tanner@seminarcrowds.com. For information on Craig Randall training programs please call 800-567-6010.